There’s no problem with delivering a solid action thriller that doesn’t reinvent the genre, but Safe House goes through the motions without an ounce of creativity or flavor. It’s the bare minimum of what an action movie should be and marches through gunfights and car chases because that’s what the genre requires, not what makes the film exciting. Denzel Washington doesn’t add much by doing a tamer retread of his Training Day performance, and Ryan Reynolds is the film’s redeeming aspect as he tries to bring a little nuance and shading to his character. But the main fault lays with director Daniel Espinosa, who knows how to make Safe House loud, but not much else. CIA Agent Matt Weston (Reynolds) is going stir crazy in his current assignment, manning a safe house in South Africa. He then gets the excitement he thinks he wants when rogue agent Tobin Frost (Washington) is brought in for interrogation after surrendering himself at the U.S. embassy. The safe house turns out to be not so much “safe” as “completely easy to breach” when a team of standard issue bad guys storm the facility and take out all of the guards except for Weston, who manages to escape with Frost in tow. Weston has to fight to survive while trying to keep Frost in custody. Meanwhile, the brass in Washington (Brendan Gleeson, Vera Farmiga, and Sam Shepard) struggle to figure out what the hell is going on and why Frost purposely surrendered after nine years on the run. The plot is supposed to be lean enough to carry the action, but only Weston’s actions make sense. He feels responsible for Frost and his mission is to make sure he gets Frost to another safe house. But Frost’s means of escape make no sense. At one point he’s wrestling to get away during a car chase (which would make him more vulnerable to the people trying to kill him), but later he goes where Weston wants him to go even though he could be obstinate and simply refuse to move. Weston can’t kill Frost so it’s a stalemate. We’re also supposed to be impressed by Frost’s cool demeanor, but it makes him a dull character since A) we’ve seen Washington play this character before; B) nothing impresses Frost. Nothing can stop him and he knows exactly what to do in every situation, so there’s no threat from either Weston or the nondescript mercenaries. That leaves Reynolds to be the heart of the film, and it’s a shame the rest of the movie doesn’t play to his level. Reynolds’ smartest choice is to show how scared Weston is at his predicament. Weston knows what he needs to do, but this isn’t a guy who’s a super-agent waiting to be unleashed. A character who’s trying to figure things out is far more interesting than one who’s already figured everything out. But I’ll take both over a guy who hasn’t figured anything out. 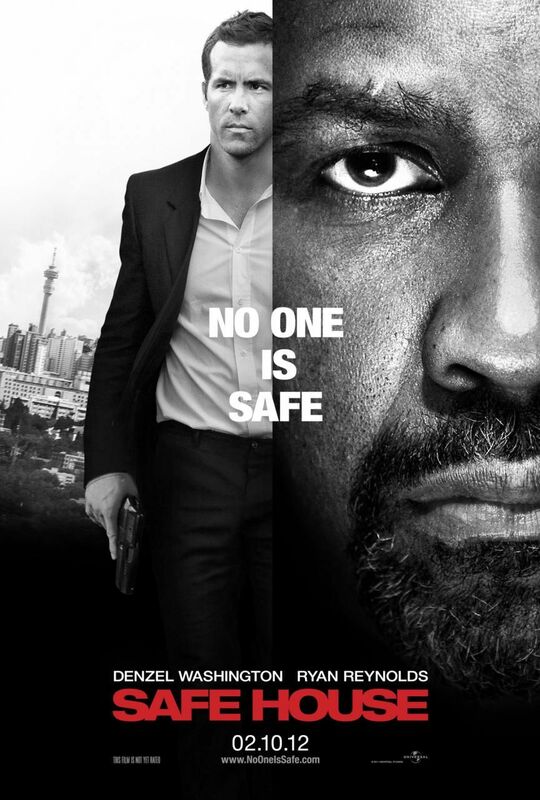 The direction of Safe House is remarkably lazy and uninspired. Espinosa marches through the action beats of gunfight, car chase, gunfight, car chase, and throws in the occasional fist fight to mix it up. There’s nothing wrong with an action movie having gunfights and car chases. The problem arises when they don’t have an ounce of creativity. Cars drive fast, people shoot at each other, and no one took five seconds to think “What would be a cool way to crash a car?” or “How can we liven up this gunfight beyond loud noises?” For Espinosa, action consists of shaking your camera around like a madman (unless you want to throw consistency out the window and do a super-cool slow-mo shot of people falling out a window), toss in the occasional boom or sudden kill, and call it a day. A new action movie doesn’t need to reinvent the genre or play against every single expectation. Competency and a little creativity can go a long way. Without them, we stop focusing on the thriller and begin picking apart the script because we’ll do anything to keep paying attention. Reynolds keeps us caring about his character, but everyone else does their damnedest to make sure we keep checking our wristwatches.